I am on the road. Starting with a memorial service for my grand aunt Helen B. Fenn, aka. "Aunt Honey Bee." The memorial was very moving and it was really great to re-connect with family members whom I have not seen in many years and some that I never met before. 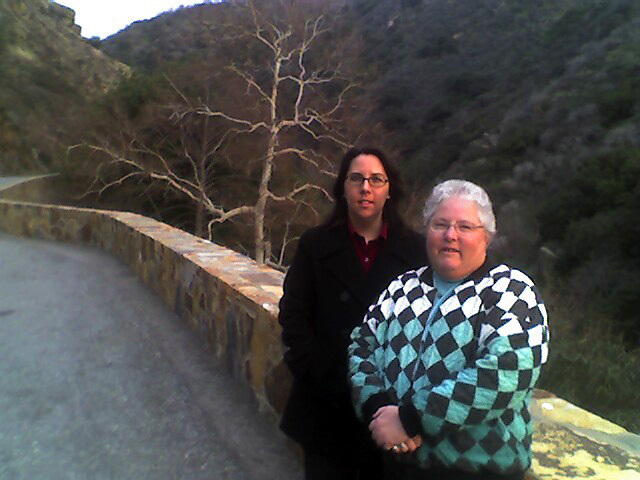 Here is a picture of my Mom and my cousin Kari on the road up from Three Rivers, California, in Sequoia National Park. The sun was setting and the light was fantastic. Too bad the only camera we had was my Treo. My Mom and I are traveling together. We stayed in Three Rivers for two nights, then at the Sacremento Hostel for one night. Now we are staying with some old family friends in San Jose. The Web of Life, a book written by Austrian physicist turned Eco-Literacy champion Fritjof Capra is a cogently argued case for defining the concept of life in a new way that reflects the insights of several scientific disciplines that have only come into existence in the last 50 years or so. But, the more important point for philosophical consideration is the fundamental insight into the universe upon which the argument is based; namely that there are four principle aspects that must be explained in order for any understanding of the world to be complete. The four principle aspects of any understanding of the world are structure, process, pattern and the scale of the holons involved. Capra did believe he was making a contribution to philosophy, but he was focused on the specific philosophy of deep ecology which he addresses in the first part of the book. I am not especially concerned with deep ecology; I suppose I might be aligned with it as a movement, but don’t identify myself with it. The greater value of his work in my opinion is the more basic philosophical assumptions he made in order to arrive at his insights into biology and by extension, his support of deep ecology as a philosophy. Capra portrays the historical context for his insights as arising out of a synthesis of the two competing definitions of life that have historically dominated the field of biology and have been competing with each other as if they were each complete definitions that must be mutually exclusive of the other. In fact, Capra tells us, they were each only partly complete and require a third leg to stand up, plus, a proper floor to stand on. Only when the whole stool was built would we have a solution for sitting on our laurels. The two main competitors in the contest to define life were mechanism, which emphasized the study of biological structures versus holism, which emphasized the study of biological patterns. These two competitors both generally overlooked process and even if they did see it they would still have been unlikely to create a stool out of those seemingly disparate pieces. Essentially the real problem was that they each had a good solid stick in their hand and they each thought that their stick was the best way to prop yourself up, but failed to realize that what was really needed was a place to sit. The sitting place that Capra proposes will allow us to take a load off and really get down to the business of improving the human condition. At least that’s what I get from it by taking from his book, not the biological insight, but the philosophical insight that he built his biology upon. Let’s consider the four principles and then see where they take us in philosophical terms. Structure is the most obvious principle. It is embodied in the objects that we can touch, feel and grasp. Structure is one of the most literal concepts we have because it is one of the most fundamental to our experience of the world. Objectivity is most solidly grounded in the study of the structure of the physical universe. No matter what other beliefs you have we can all agree on the things of the world, the things that we all touch and share the experience of touching. Pattern is the next most obvious principle. Pattern is what happens to structures through time. If we have a seed and we take a picture of it then we have recorded the structure of the seed at that moment in time. If it is moist and warm then a few days later when we come back and take another picture it is no longer merely a seed, but a seedling with a shoot sticking out of it. And if we take another photograph a while after that we have a plant with roots, a stem and leaves. If you were to compare the original photo of the seed to the final photo of the plant without knowing anything else about how the photos were taken and never having experienced that particular kind of plant before it would be impossible to know that the seed structure was a previous incarnation of that plant structure. But when seedling photos show you the split seed casing and then the emergence of similar leaves then you have more insight about the progression of events. We all know and can agree that pattern is a consistent and fundamental aspect of our experience. Process is much more subtle and difficult to comprehend. If we want to know exactly how the photos connect to each other then we take a lot more photos to fill in the gaps, we make a movie. But when we make a movie we just get more detail about the unfolding pattern before us and the truth is that if we remain at the same level of scale then watching a plant grow in slow motion is going to get really boring and will not reveal any new information. The trick to our coming to understand process was the advent of microscopy and the ability to see the cellular structures that make up the plant at very small scales. This was a great achievement, but it then presents a problem with our ability to connect what we learn at the scales of cells, or more recently molecules, with the original movie of a whole seed/seedling/plant. We know logically that each of the photos is a moment in time that had to have preceding and proceeding moments that connected it to each of the other photos and to our present moment. We innately understand that when you put a lot of small things together they add up to a big thing. But what we have discovered about the very small is that it doesn’t just add up (and the same is also true about the very big.) There are some things at the scale of the very small that occur in ways that we are still struggling to comprehend, genetics is a great example. We know a lot about the structure of the DNA molecule and we know a lot about its patterns, but we are just barely beginning to figure out how the process works whereby the molecular structure changes the cellular body from moment to moment as it causes the pattern of a living thing to unfold over time and at scales of many magnitudes larger than the DNA molecule itself. So structure is essentially the stuff of the universe, pattern is how the stuff occurs through time and process is how the stuff that occurs in time gets from one arrangement to another. These are the three legs of our stool. But the problem is that two of the legs are intuitively easy while the third is a potential mind bender and sometimes completely defies our intuitive understanding of how things are supposed to work. It’s like we are holding the three pieces of wood up and since one looks a lot shorter than the other two we don’t yet see them as anything other than a bunch of sticks. The key to bringing it all together is understanding the similarities between a seat and a floor so that the legs can be arranged to support a seat. The concept of holons is a necessary element in this meta-model of how our universe occurs because we need to be able to talk sensibly about how to tie the different scales of our universe together when our innate understanding of our own scale of normal boldily perception fails to accurately describe reality. There is an old concept of the universe that it consists of some very small basic material units, once called atoms, and that these basic units comprise everything in the universe. Once they found atoms, then they looked closer and found sub-atomic particles, and ever since they have consistently found and more recently confidently theorized ever smaller units. Arthur Koestler reframed the problem by saying that the universe is, in fact, made up of holons which are not material entities, but simply units defined by wholeness and simultaneous partness such that every holon consists of smaller less complex holons and at the same time makes up larger more complex holons. An atom simultaneously consists of subatomic particles and can make up part of a molecule. We are each made up of cells and make up families, businesses, and other groups that act as a whole unit in the world. Both atoms and people are holons. One of the keys to understanding holons is that they have emergent properties that are unique at each level of scale. Knowing the properties of hydrogen atoms and oxygen atoms does not give us the ability to predict the properties of water, one of several molecules formed by the combination of hydrogen atoms and oxygen atoms. The properties of water are an emergent phenomenon of the molecular scale of our universe. Similarly the behavior of organizations are not predictable based on an understanding of the individual people who belong to it. Because there are unique emergent properties at every level of scale then it is important to distinguish what scale of holons are under consideration in any discussion about the world. The problem of the stool is in how we fit the parts together to achieve a platform for comfortably sitting our butts down without risk of injury or indignity. And the fact is that we are stuck with the materials at hand, so we have to arrange them so that we create a very floor-like surface in miniature perched on top of the three sticks we have available (now transformed into legs). Once we have created the idea of legs and a seat (a pattern), then we can use these concepts as an approach (a process) for creating seats (structures) in a vast array of styles and utilize ever more creative structures to manifest the basic pattern. Thus we kick-off a seating revolution. To get back to the Web Of Life, the most important part of this work is the meta-model of the universe that allows these four elements (structure, process, pattern and holons) to fit together to create a new understanding of the nature of the universe itself. When looking through the lens of structure, process, pattern, and holons then we can analyze the world in new ways to arrive at more complete solutions. The advantage of sitting off the floor is the new opportunities that come from imagining and then creating ever more interesting and beautiful ways to realize this new pattern. What I propose is not going to be functionally different from our metaphorically sitting on the floor throughout all previous history, but it will be aesthetically different. Not everyone will want to sit this way and no one has a fundamental need to sit this way, but for those who choose this way it provides another option that might serve as a comfort when we are tired or ill at ease. And it will certainly provide more opportunities for every individual who embraces it to express themselves in new and unique ways. The way of sustainability is an aesthetic decision, not a survival decision, for individuals like us. It may or may not be a survival decision for organizations and/or societies, and since I am writing for individuals that is not my concern right now. I plan to develop this line of thought further, so I appreciate feedback that will help in that development process. Here's a picture of my friend Heron when we were playing at the Oregon Museum of Science and Industry in Portand. 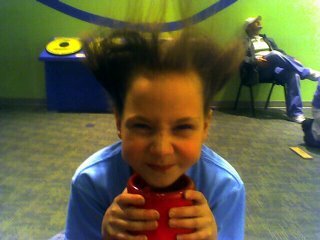 Unfortunately I didn't think to get the camera out when we were playing with the static generator, which was also hair raising fun. I recently finished the book Collapse: How societies choose to fail or succeed by Jared Diamond and I read The Skeptical Environmentalist: Measuring the real state of the world by Bjorn Lomborg for the first time about a year ago. Both of these books are extensive scholarly investigations into the truth of our current environmental issues. Diamond looks from the perspective of drawing historical parallels with society’s that have failed in the past. While Lomborg looks from the perspective of a statistician questioning the suite of doomsday factoids that are repeated endlessly and that he refers to as “The Litany.” The way that these authors are portrayed by reviewers and critics would have you believe that they are at polar opposites of the spectrum of views on the environment. Lomborg’s book is touted as an anti-doomsday foil to the environmentalist cause, whereas Diamond’s book is touted as a far-reaching and authoritative doomsday prediction. What strikes me is that in reading these books I can certainly see that they are both directly addressing the doomsday scenarios that we are bombarded with, but the central message of both of these authors is that doomsday thinking is irrelevant to the real solutions that will make a difference in the world today. In my investigation of Lomborg’s book, after being taken aback by it, I wanted to get an assessment of it’s validity. So, I went to the internet and found a vast array of discussion that almost all occurred shortly after it’s release and consisted almost exclusively of either “environmental advocates” attacking the book as a tool of anti-environmentalism or others expounding it’s virtues as a slap in the face to fear mongering liberals. “On the whole I believe it is important to emphasize that being overly optimistic is not without costs, but that being too pessimistic also carries a hefty price tag. [italics in the original] If we do not believe in the future we will become more apathetic, indifferent and scared – hiding within ourselves. And even if we choose to fight for the planet it will very probably be as part of a project that is born not of reasonable analysis but of increasing fear. “Of course we cannot simply choose to believe in the future. But the documentation and the arguments in this book can have a considerable effect because they can free us of our unproductive worries. They can give us new faith in the fact that we are involved in creating a better world by taking part in society’s production of assets, tangible as well as intangible. While it is too soon after it’s release to expect a scholarly review of the debate that is still active it is useful to consider the one most obvious criticism of Diamond’s method from the anti-environmentalist front and also to look at the optimism for which he is receiving criticism from the environmentalists front. Are the collapsed ancient societies analyzed in the book sufficiently parallel to our current society to make a legitimate comparison? The key to drawing a legitimate parallel is to establish that at least one critically important characteristic of the original situation is also true of the subsequent situation. Those who point to our advanced technologies and superior wealth have completely missed the point that Diamond makes about the crucial characteristics that make our current civilization vulnerable to the kinds of collapse that occurred in the past. The characteristic that Diamond asserts as critical to understanding the collapse of the civilizations he looked at is the isolation from additional resources that would effectively relieve the pressures that cause collapse. Easter Island is the paradigmatic example he uses because it was the most radically isolated. It is also a great example because the remaining evidence that inspires people to wonder about that society, the infamous statues, are a perfect icon for the patterns of behavior that Diamond believes lead to their destruction as a civilized society. Is our society isolated? That begs the question of what you mean by “our society.” If you mean the USA or even the “first world,” then the answer is no. And that is probably what most of the critics who raise this argument have in mind. But that answer is also a very naïve view of what constitutes our current society. I favor the views of Daniel Quinn and Sharif Abdullah that posit only two or three societies on our whole planet. (Quinn is author of My Ishmael. Abdullah wrote Creating A World That Works For All.) In this way of thinking we, as humans, started out with only one kind of society, what Abdullah calls the Keepers. These are the Keepers of the Sacred Hoop. These are people who see themselves as an interconnected part of the whole of existence. They believe that their fate is in the hands of the gods and therefore they have to live within that reality. (In talking about the beliefs of a culture, I do not simply mean the beliefs they talk about, I mean the conceptual structures that shape their everyday behaviors. Thus, what I am referring to as beliefs are mostly unconscious to the individuals who make up the culture.) The Keepers are those societies that live in traditional aboriginal ways, meaning that there are virtually none left. Some time later there arose another kind of society, what Abdullah calls the Breakers. These are the Breakers of the Sacred Hoop. These are people who see that their fate is in their own hands and that the gods gave them the world and responsibility for it therefore they have to live within that reality. The Breakers as a society transcend all the popular distinctions of “first” and “third” worlds. Quinn’s idea about societies is limited to only two, but Abdullah takes it a step further by claiming that a new society is emerging, what he calls the Menders. These are the Menders of the Sacred Hoop. These are people who see that both of the previously existing societies have had very valuable insights into the nature of reality and the Menders are drawing constructively from both traditions and attempting to leave behind that which is destructive. These are people who see that they are in a process of co-creating the world with the gods and their fate is always in a delicate balance between responsibility for taking right action and the whims of forces greater than they can individually comprehend. Therefore, they have to live within that reality. The emerging society of Menders is arising out of the Breaker society therefore they can for this moment be considered as a singular society for my purpose here, and that society is global in scope. The global nature of this society means that in order have access to resources that could relieve the pressures that are building towards collapse we would have to have access to another planet with carbon based life forms. For now and for the foreseeable future we are effectively isolated by that criteria, therefore Diamonds point holds true. Critics on the other side of the spectrum who largely accept the comparison tend to miss the key element of his optimism, which is once again a parallel characteristic that he drew from selected examples of societies that successfully avoided collapse under similar circumstances. The characteristic that Diamond asserts as critical to the avoidance of collapse is the passionate engagement with the realities of the situation that individuals have exhibited when faced with a crisis that affects the whole society. In some cases that passionate engagement was championed by elite leaders and in others it was championed by the masses, in all cases the passion for engaging was able to overcome the cultural and institutional inertia of traditional values in a way that had the society abandon one or a few practices that were destructive to their long term survival as a society. In order to argue the validity of his optimism it is necessary to see that our society is not hopelessly mired in intractable problems that are impossible to understand let alone solve. Unfortunately, Diamond does a really good job of conveying the complexity of the challenges without a commensurate explanation of why his optimism is well founded. My personal criticism of his book is that he has brilliantly analyzed and communicated the complex logic of the problem and then only briefly outlined the nature of the solution. I hope that his next book focuses on the complex nature of the solutions that he hints at in this work. Here is the central lesson I draw from Diamond, in his own words: “One basis for hope is that, realistically, we are not beset by insoluble problems. While we do face big risks, the most serious ones are not ones beyond our control, like a possible collision with an asteroid of a size that hits the Earth every hundred million years or so. Instead, they are ones that we are generating ourselves. Because we are the cause of our environmental problems, we are the ones in control of them, and we can choose or not choose to stop causing them and start solving them. The future is up for grabs, lying in our own hands. We don’t need new technologies to solve our problems; while new technologies can make some contribution, for the most part we ‘just’ need the political will to apply solutions already available. Of course, that’s a big ‘just.’ But many societies did find the necessary political will in the past. Our modern societies have already found the will to solve some of our problems, and to achieve partial solutions to others. What’s Relevant, If Doomsday Isn’t? The common thread in both books. Regardless of how you analyze the data, everyone agrees that some resources are renewable in practical ways and others are not. The resources that are not renewable on a practical timeline are therefore finite and once we use them they are gone forever. For the resources that are renewable we can only use them as fast as they renew, otherwise they will disappear forever. In order for us to avoid the fate of the Easter Islanders, we have to live within the realities of resource renewal. If we are consuming non-renewables, then we should be consuming them efficiently and with a goal of finding renewables that can eventually replace them for meeting the same needs. Until we can replace all nonrenewable resources with renewable ones, then we are logically on a global path towards an Easter Island outcome. The disaster will take longer or shorter to arrive but it is inevitable. Thus doomsday is an agreed upon fact, but it is still, in the stated opinions of both of these authors, irrelevant to the solution. The solution is the focused application of passion and enthusiasm. The generation, cultivation, harvest and renewal of passion and enthusiasm are the true sustainability problems that we face. The question is not whether people have the energy of passion and enthusiasm, the question is whether we are utilizing it within the reality of the cycle that it requires to be renewed. Overly optimistic and overly pessimistic views of the state of the world and our future prospects will lead to destruction if they result in driving people to avoid our problems and driving those who are facing them to distraction. The truth is often somewhere in between the two and what is most needed in our society is a citizenry willing to confront the distortions on all sides and build our strategic plan on the core facts that we all agree upon. I find it immanently instructive that both Diamond, the doomsday advocate, and Lomborg, the doomsday foil, both arrive at the same ultimate conclusion: the difference to be made in this world is the application of human ingenuity to the realization of Truth and the pursuit of Goodness. I believe the best tools we have for accomplishing both of those tasks are the ones in our heads and hearts. There is not a single tool, technology or technique that lies out side ourselves that needs to be created in order to effectively address true challenges we face. The only real question is whether we have the courage to seek the truth and the perseverance to achieve goodness.